This recently renovated single level four-bedroom lake front property offers tranquil accommodation with tastefully appointed furnishings. With wonderful, elevated lake front views set above a lush ponga tree canopy leading to one of the best trophy trout lakes in the world. Stroll down the short private path under the beautiful ponga fern tree canopy to the flat lake edge and a sandy swimming beach. Less than 100 metres in one direction is the Stoney Point Playground, Picnic BBQ area, Volley Ball court and Boat Ramp; the other way is the shared lakefront pumice based Tennis Court and Walking Tracks. Use the new tennis racquets to have a game, grab one of the new kayaks and head out on the lake to explore or develop your paddling skills on one of the new paddle boards on offer - all included in your stay! The Boat Shed offers easy access from Spencer Road for both cars and boats for the whole family with off street parking. All next to one of the easiest and least crowed boat ramps in Tarawera. 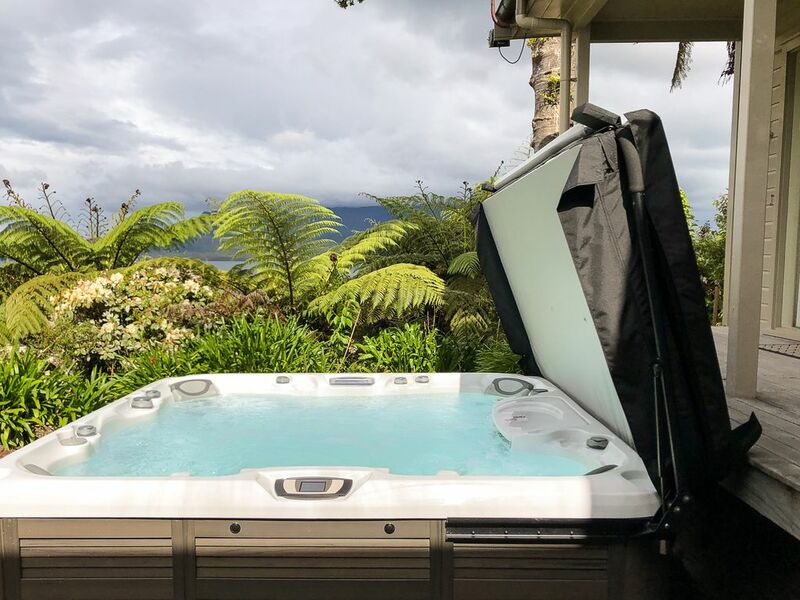 Once you've settled in, relax on the sun-drenched deck and enjoy the sound of native birds, the waves on the sand and the spectacular views of Mt Tarawera. Inside, there are polished timber floors, entertainers wrap around sofa setting, large square boat shed timber dining table with leather chairs and log fireplace create an elegant atmosphere. The open plan granite kitchen is fully equipped with quality non-stick crockery and utensils and a Nespresso Coffee Machine. Separate TV/Play room with 60 inch HD TV, Playstation 4, DVD player and Sky TV (including sport channels) make a comfortable stay for the whole family. Lake Tarawera is only a short 5 minute drive to the Blue and Green Lakes, 8 minutes to Lake Okareka, 15 minutes to Rotorua, 30 minutes to Lake Rotoiti, and approximately 1 hour to Tauranga, Lake Taupo, Karapiro, Hamilton and many more attractions. The Boat Shed is available for a maximum of 11 guests. To secure your holiday dates a non-refundable deposit of 50% of the rental is payable at the time of booking. The deposit will only be refunded if the house can be relet in the event of a cancellation. The balance of your rental is due 3 weeks prior to arrival. Please leave the house in a tidy condition. Minimum stay of 3 nights preferred. Easy vehicle access with off street parking for up to 4 cars, boat or jet ski. Spa pool under the stars. There is nothing more that a few steps down to the Lake front. Keep an eye out for the glow worms at night! Great place to stay, awesome location and very quick responses and excellent communication! Lovely fresh clean decor. Loved how the tv / games room is separate to keep the kids entertained. Amazing views over lake and fantastic deck space to soak it all in. Spa pool is huge and great to relax in. Loved the pizza oven. The kitchen stocked everything you needed. We had two boats and cars, and after mastering the driveway plenty of room to park. Had a great weekend at the Boat Shed, fabulous location and appreciated the use of the paddle boards. House very well equipped and comfortable. Location perfect 10 out of 10 Hosts excellent ????????????? ?